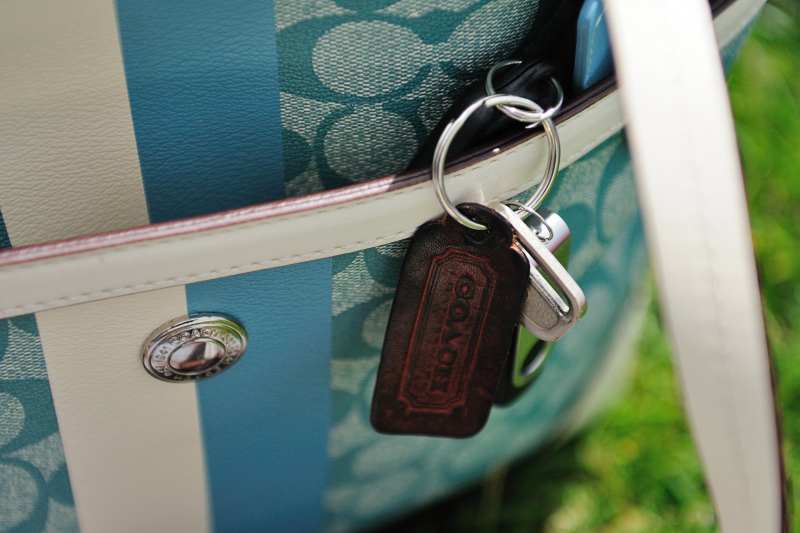 I have a confession to make - I have a weakness for Coach Bags. My obsession started many, many years ago, in High School when I saved up my money to buy my first Coach bag, a skinny purse. I think I paid over $100 for it, but it served me well through my HS and college years. I still have it, tucked away in my cedar chest. To make matters worse (or better, you choose), I work five minutes from a Coach Outlet Store. Last week, I received a 20% off coupon for that store. I couldn't resist! My newest purchase - a springy aqua blue tote. I made sure I can fit my SLR in it. Hanging off my key chain - an old, old, old Coach tag from my 2nd Coach purse. Yeah, I love all things Coach!